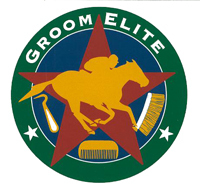 (Austin, Texas - Wednesday, March 15, 2017) - The Elite Program, Inc., through its Groom Elite™ programming, will present two important classes in April to be taught by national lead instructor and Executive Director, C. Reid McLellan, PhD. From April 5 to 7, McLellan will conduct his popular Trainers' Exam Prep Class at Lone Star Park for a 17th time. Two weeks later, April 17-21, "Dr. Mac" will be lead instructor for an inaugural Basic Grooming 099, a workforce preparation class at Magdalena Farms in Lexington, Kentucky. The Lone Star Park Trainers Exam Prep Class will be held in the chaplain's classroom in the Lone Star Park racing office for three days immediately after the Texas Thoroughbred Association's two-year-old in training sale on April 4. Tuition is $350, and participants that register early and pay tuition before March 24th pay a discounted rate of $299. This will be the 17th class McLellan has taught at Lone Star Park. Over 120 have participated in this class, including Texas-based trainer Janine Winslow, a member of the fist Lone Star class in 1998. Janine saddled winners at Delta Downs and Sam Houston in February 2017. McLellan has instructed trainers since he established an award-winning equine program at Louisiana Tech University in the 1980s. Dr. Mac is an engaging speaker who spices up otherwise dull material with personal experiences and discussion of rule changes that effect those desiring to become trainers. For more information and online registration, visit: www.groomelite.com or www.purplepowerracing.com. Basic Grooming 099 is a 16-hour, hands-on class designed for people with limited (or no) horse experience that would like to take advantage of the many job openings in the equine industry. Class will be held at Kenny McPeek's Magdalena Farms on Russell Cave Road in Lexington from April 17 through 21. McPeek and others will participate as their schedules allow. "I'll be there ever day," McPeek tweeted (@KennyMcPeek). Class is being held during the Keeneland meeting, and participants will have an opportunity to attend the races and see grooms and hotwalkers in action on Wednesday or Thursday. Participants will learn how to work safely with horses, starting with approaching safely, haltering and leading. The four-day (four hours per day) class will include daily hands-on practice. Participants will demonstrate what they have learned on Friday. Each person completing the course that is interested in applying for a job in the equine industry will be evaluated and counseled as to their readiness to work with horses. In addition, contact information of trainers and farms with job openings will be provided. Elite Program staff will assist participants in finding jobs compatible with their skill level and confidence. In addition to McPeek's Magdalena Farm, Basic Grooming 099 is sponsored in part by The Jockey Club, TOBA (through its Thoroughbred Charities of America), NTRA and the Race for Education. As a result, tuition for this class will be only $99. Class size is limited to the first 20 signing up and paying a $25 deposit to hold a spot. The remaining $74 is due April14. Anyone out of work and in need of a job can register and request assistance with tuition. "If a person wants to work in our equine industry, we want to provide them the training necessary for them to be qualified to apply for those jobs," McLellan stated. A waiting list will be established if the class is oversubscribed. Those interested are encouraged to go to www.groomelite.com and sign up. Anyone without internet access is invited to call (859) 252-8648 (Race for Education) or Dr. McLellan at (859) 321-4377 and sign up over the phone.